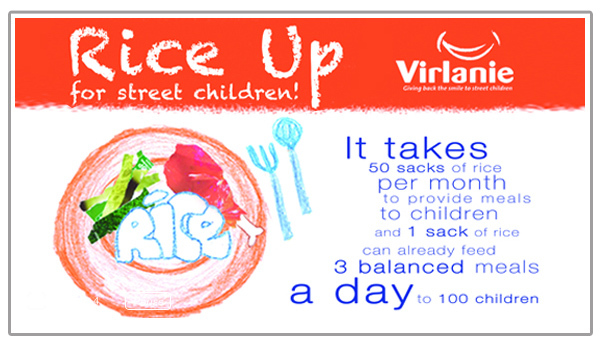 VIRLANIE FOUNDATION : Rice Up for street children! Last night I was watching a primetime sort of a short french documentary film featuring the street kids of Manila, and I was moved by it. Different kids, different families, different stories, same situaton - all are victims of life's cruelty. And because the program was in french, I did some internet sleuthing and googled the name of an extra-ordinary French man, Mr. Dominique Lemay and his foundation who help these street kids. They provide them a home, a family, a future. "Virlanie Foundation is a non-government organization (NGO) reaching out to street children. It cares for children in need of special protection: abandoned, abused, exploited, neglected, orphaned, poor… Close to 200 staff and volunteers, supported by a network of donors and sponsors, touched the lives of 1,211 street children in 2011. Founded by French social worker, Dominique Lemay and his Filipino friends, the non-profit foundation celebrates its 20th anniversary in 2012. Since 1992, Virlanie has helped 14,700 children become responsible and self-sufficient adults." And in time for Christmas, let's spread the spirit of giving by helping Virlanie Foundation feed more than 400 children in their 12 Homes and Outreach Programs through the Rice Up Campaign for Street Children. Let us help them gather 600 sacks of rice to feed the children for the coming year. They accept donations, in cash and in-kind. You can visit their website and facebook page for more details.